Imaginations were stoked this week when Amazon CEO Jeff Bezos predicted that his company will begin to offer 30 minute package delivery by drone in a few years. Who couldn’t get excited about drones flying around dropping packages on our door steps in mere minutes after we click the mouse? While the idea sounds fascinating, there obviously are a lot of questions to be answered about delivery by drone. And some of them are troubling. According to a drone expert at MIT named Missy Cummings, there are still a number of things to be worked out before delivery by drone becomes reality. Cummings says that it is unlikely that drone deliveries could work by 2015, as Bezos claimed. First of all, the FAA has to sign off on any flight plans. And that agency has been slow to ok domestic use of drones. Cummings thinks that Amazon will get approval for Amazon Prime Air, as Bezos terms it currently, in foreign countries first. Bezos stated in a 60 Minutes interview this week that the drones will have a 10 mile radius. So, it is more likely that people who order in big cities will be more likely to opt for drone delivery. Bezos said that initial deliveries would be only up to five pounds, which is more than 80% of Amazon deliveries. But for the 10 mile radius to be even feasible, Amazon will need to work on battery life for the drones. Current battery life for the prototype Amazon drone is only 30 minutes, and the weight of the package will shorten this time. Another obvious issue with delivery drones is that someone may try to knock them down, for fun if nothing else. Also, people could try to shoot down the drones to steal the packages. Cummings thinks that drones will have to fly most of the time over 300 feet up to avoid thieves and shooters. Also, will the drones be able to fly when the weather is bad? Current drones can fly in light rain, but heavy rain or snow would disable important sensors. If the weather is a major issue for flights, this could really limit the viability of the service. Interestingly, Amazon, which also is partnering with the US Postal Service to deliver packages on Sunday, is not the only company thinking about drone delivery. Dominos Pizza is considering using drones to deliver pizzas, and two engineers recently created what they called the Burrito Bomber, which showed that they could deliver burritos to home with a drone. 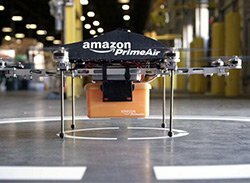 We do not know for sure where Amazon’s efforts will lead, but we have to say, the prospect of Amazon Prime Air is fascinating! What a cool new direction for e-commerce.